Here is a list of military lost in Vietnam by rank. To view click here and you will be taken to it. National Vietnam War Veterans Day – March 29 Annually. The Vietnam War Veterans Recognition Act of 2017: National Vietnam War Veterans Day – March 29 Annually It’s Official: March 29 Is National Vietnam War Veterans Day. (Washington, DC) – “Forty-two years ago on march 29th, the last American combat troops left the former South Vietnam, marking the end of what was then our nation’s longest war,” Yesterday, the bipartisan legislation, S.305, authored by Senators Pat Toomey (R-Pa.) and Joe Donnelly (D-Ind. ), permanently designating March 29th as National Vietnam War Veterans Day, was signed into law by President Trump.” “The Vietnam War Veterans Recognition Act of 2017 is the first federal statute to recognize in perpetuity the bravery and sacrifice of veterans who served during the Vietnam War. — Today the U.S. Department of Veterans Affairs (VA) announced that the application process for the national Veterans Identification Card (VIC) is now available for Veterans — yet another action honoring their service. 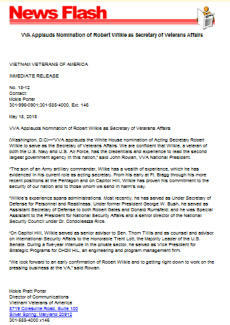 honorable service will be able to apply for the ID card, which will provide proof of military service, and may be accepted by retailers in lieu of the standard DD-214 form to obtain promotional discounts and other services where offered to Veterans.
. A digital version of the VIC will be available online by mid-December. to talk to agents who could relate to their experiences. The White House VA Hotline provides our nation’s Veterans with a direct, dedicated contact line that allows them to interact with highly trained, live agents to answer their needs and concerns,” said VA Secretary David J. Shulkin. “Since the initial launch of the hotline in June, we listened to our Veterans, who indicated that they prefer speaking with other Veterans and Veteran family members, and we adjusted our hiring based on that feedback,”added Shulkin. and is VA’s first non-clinical, non-emergency around-the-clock call center. It provides Veterans a supplemental option to report issues if they are not being addressed through VA’s normal customer service channels. A multi-day networking event for Arizona’s veterans will return to Phoenix 14 - 16 November to celebrate Heropreurs - veteran owned businesses and to support veteran employment. to enter into agreements with state veterans homes to pay for adult day health care for a veteran eligible for, but not receiving, nursing home care. The Vietnam War Veterans Recognition Act of 2017: National Vietnam War Veterans Day – March 29 Annually It’s Official: March 29 Is National Vietnam War Veterans Day. (Washington, DC) – “Forty- two years ago on march 29th, the last American combat troops left the former South Vietnam, marking the end of what was then our nation’s longest war,” Yesterday, the bipartisan legislation, S.305, authored by Senators Pat Toomey (R-Pa.) and Joe Donnelly (D-Ind. ), permanently designating March 29th as National Vietnam War Veterans Day, was signed into law by President Trump.” “The Vietnam War Veterans Recognition Act of 2017 is the first federal statute to recognize in perpetuity the bravery and sacrifice of veterans who served during the Vietnam War. First, VA will expand the Rapid Appeals Modernization Program (RAMP,) by removing the requirement that Veterans first receive an invitation from VA in order to elect participation in the program. RAMP, which was initially launched in November 2017 as an invitation only program, allows eligible Veterans with a disability compensation appeal early access to the Higher- Level Review and Supplemental Claim Lanes outlined in the Appeals Modernization Act. By removing the invitation requirement, Veterans will have the opportunity to benefit from the new, more efficient decision review process, versus continuing to wait in the legacy appeal process. As of March 31, RAMP reviews were completed in an average of 52 days.